As a general rule of thumb when I travel, I liked to visit restaurants early in their operating hours so that they are less busy and there is less of a chance of accidental cross contamination. On Sundays, the Downtown location of District Taco opens at 10am, so I made my way over to the restaurant to be there when they opened. District Taco's menu is pretty allergen friendly, and you can see for yourself at this link. For gluten-free eaters, avoid the flour taco and burrito tortillas, and then you're good to go since all other ingredients are safe. Dairy-free diners take note the queso, cheese, sour cream, and fish (tacos) are off limits. Chips are safe according to the allergen menu, but I forgot to ask if there was potential cross contamination from a shared fryer. When I stepped up to order, I let the cashier know that I was gluten-free. 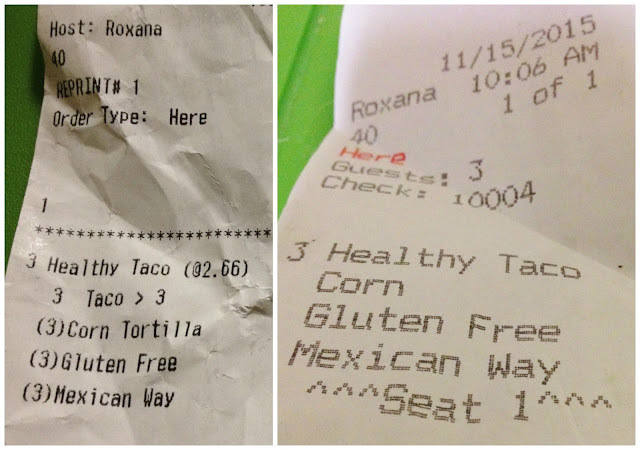 She keyed it in to the system, and I was happy to see clear "gluten free" labeling on my receipt and the kitchen ticket. Because it was breakfast for me, I decided to order three "healthy tacos" the "Mexican way" which translates to three egg white tacos topped with onion and cilantro. After placing my order, I was able to see it be made in the open kitchen area, and was impressed that the grill was cleaned before my eggs were made and that the tortillas were warmed with a layer of aluminum foil between them and the grill. After a few minutes of waiting my taco trio was presented to me. Each taco is wrapped in foil to make them easier to eat, but of course I unwrapped them to get a perfect picture for the blog. The tortillas are soft and delicious, doubled up to maximize their support of the ingredients inside. The egg whites, protein rich and cooked to perfection added the perfect amount of "breakfast-y" flavor to my meal. The cilantro and onion were fresh, and not too overwhelming in flavor. There is a salsa bar at which patrons can further dress up their tacos, but I decided to skip it not because of cross contamination (because all salsas and sauces are gluten-free) but because my tacos were perfect without needing any additional flavors. Although I am not a big soda drinker, I did want to mention that District Taco has Boylan Sodas on hand in a fountain machine, something I have never seen before in a restaurant setting. Boylan's sodas are made with pure cane sugar and I think it was cool to see this brand as the soda of choice versus high fructose cane sugar-laced beverages. Overall, I really liked the vibe and cuisine of District Taco. While the food may be frill-free, it is real and delicious, totally winning over my taco-loving taste buds. Kudos to District Taco for introducing me to the concept of egg tacos, which will definitely spice up my my breakfast routine going forward. I definitely would go back to District Taco on a future D.C. visit, and love that their menu is naturally inclined to be gluten and dairy-free friendly. For $8 I certainly cannot complain, and you would be hard pressed to find a cheaper breakfast in the District. Price: See menu prices on the restaurant's page, click here. Special Feature: Order online, click here.